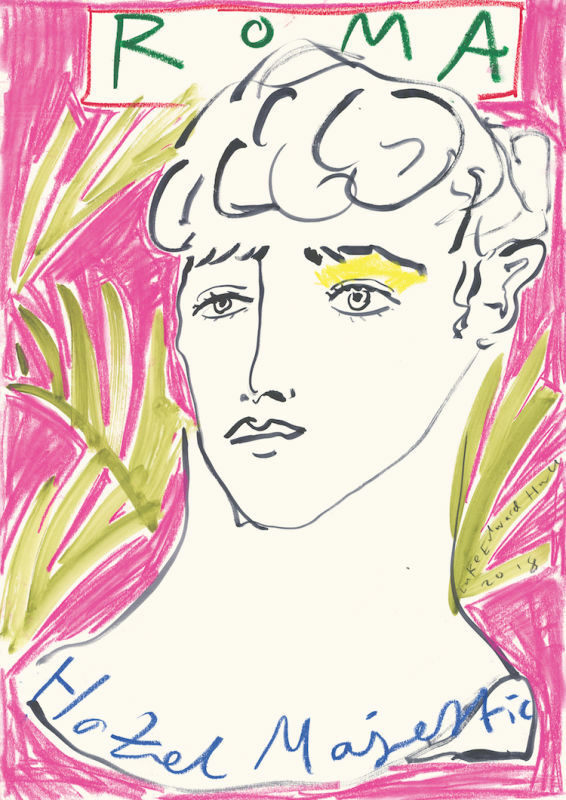 Illustrator, designer and fashion’s favourite young polymath, Luke Edward Hall is now showing new work in Soho. Last summer, when Luke Edward Hall was on one of the many tantalizing European trips he regularly posts on his Instagram account, he had an epiphany. As he was reading a biography on Stephen Tennant one particular passage stopped him in his tracks: the book recounted a short trip to Italy that Tennant had taken with his friend and lover Siegfried Sassoon in the late 1920s. The story inspired Hall to create a series of paintings and drawings (in his signature Cocteau-meets-classism style) that is entirely devoted to his favourite destination – Italy. The result - Hotel Majestic - will be exhibited from 23 May – 6 June at Alex Eagle Studio and alongside artwork there is Hall’s evocative ceramics, trays, matches and prints. There is also be a limited edition catalogue of the show which can also be bought from the artist’s own website.